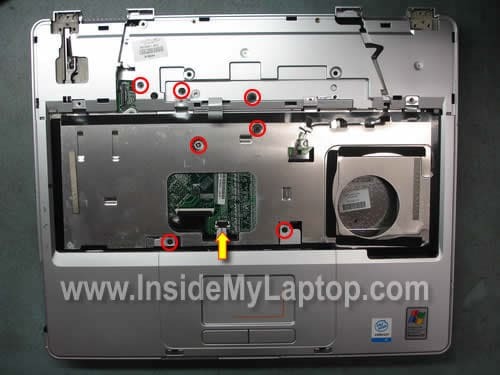 In this guide I will be taking apart a Compaq Presario M2000 notebook. The guide should work for all other notebooks in the Presario M2000 line. If it works for you, please mention the notebook model in the comments below. In my case I’m taking apart a Compaq Presario M2005US. First of all, turn off the notebook, unplug the power adapter and remove the battery. 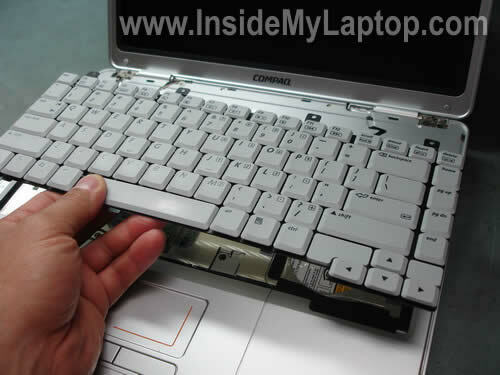 The following 8 steps explain how to remove the keyboard. Lift up one side of the keyboard bezel with a small flat head screwdriver. Continue removing the bezel with your fingers. The keyboard bezel has been removed. Lift up the keyboard. Be careful because the keyboard is still connected to the motherboard. Place the keyboard so you can access the cable connector. Carefully unlock the connector by moving the white part of the connector towards the hinges. WARNING! If you accidentally break the connector, you will have to replace the whole motherboard or use the notebook with an external keyboard. You will find the keyboard part number on the back side of the keyboard. 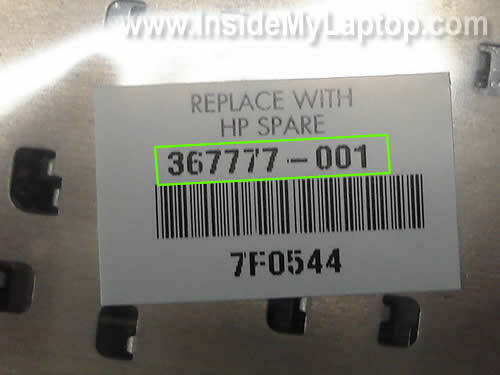 In my laptop the part number is 367777-001. 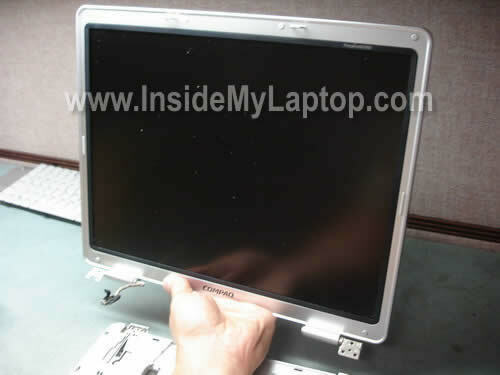 In the following 2 steps I will remove the notebook LCD panel. Remove six screws securing the display hinges (three screws per hinge). Disconnect the LCD cable (video cable) from the motherboard. 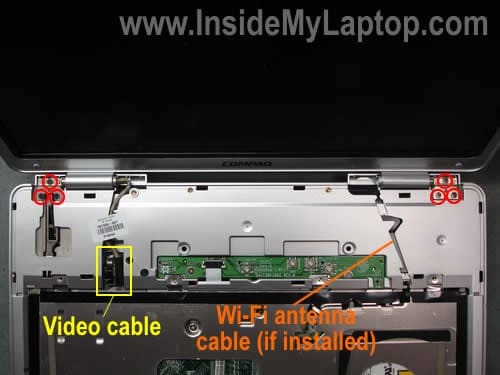 If you laptop came with Wi-Fi card, you’ll have to disconnect Wi-Fi antenna cables from the wireless card and unroute the cables. My laptop came without wireless card and because of that there are no Wi-Fi antenna cables running from the display panel. By the way, you’ll find the display panel part number on a sticker above the LCD cable connector. In my case the part number is 381066-001. This is part number for the whole display panel assembly including the LCD screen, video cable, hinges, plastic cover and bezel. Some sellers use this part number just for the LCD screen. Make sure you know what you are buying, the whole display panel or just the LCD screen. Ask the seller. 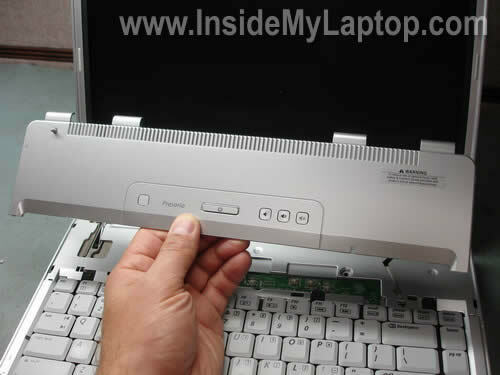 In the next guide I explain how to disassemble the display panel so you can remove the inverter board and LCD screen. 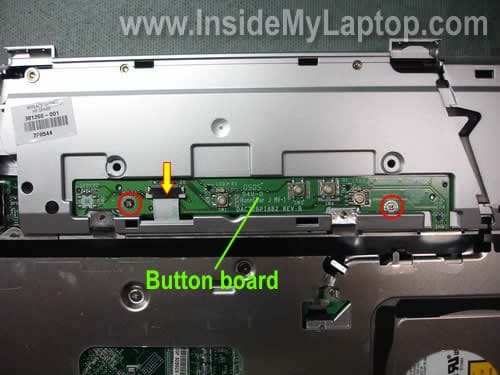 Remove two screws securing the button board. Disconnect the white ribbon cable from the button board. Remove the button board. 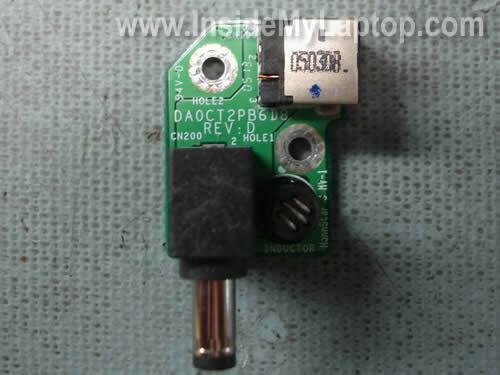 You can find a new button board using this part number: DACT2BPI6B2. 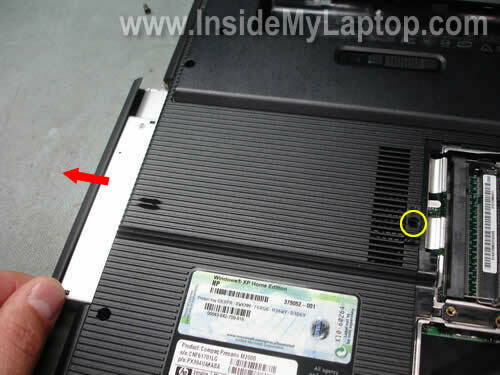 Remove the RAM, HDD and Wi-Fi card covers from the bottom of the notebook. Pull the hard drive up and remove it from the notebook. Remove both memory RAM modules. 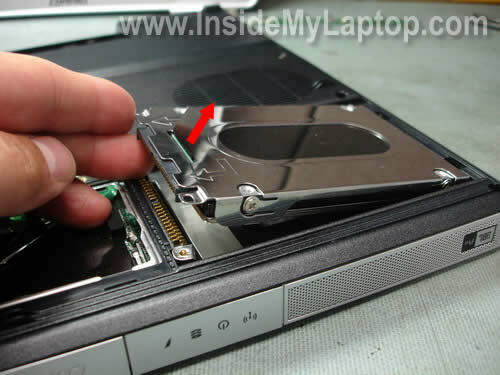 Remove one screws securing the CD/DVD drive and pull the drive from the notebook. If you are just replacing the drive, you don’t have to go though all previous disassembly steps. Remove all screws from the bottom of the notebook. Remove all screws securing the top cover. Turn the notebook upside down and carefully lift up the base cover. Now you can access the cooling fan. 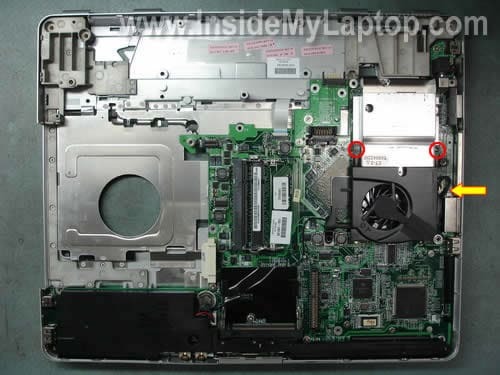 In order to remove the fan you’ll have to remove two screws and unplug the fan cable from the motherboard. Remove the cooling fan and replace it with a new one if needed. 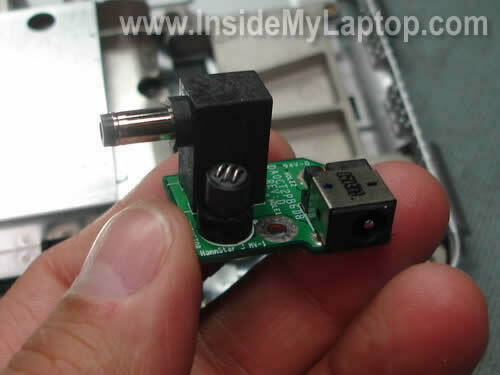 Unplug the speaker assembly cable from the motherboard and remove the speaker assembly. The battery is connected to the motherboard via a battery board. Remove two screws securing the battery board and disconnect it from the motherboard. 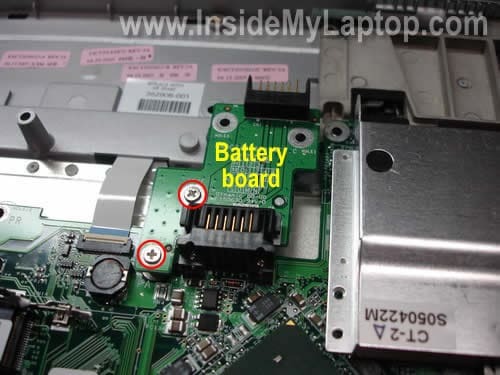 In a Presario M2000 notebook the power connector (power jack) is located on a separate power connector board. You can remove and replace the power connector board without removing the motherboard. Remove two screws securing the power connector board and unplug it from the motherboard. The power connector board is removed. Using the part number DA0CT2PB6D8 you can find a new one on the Internet. In a case of power connector (power jack) failure either replace the power jack or replace the whole power connector board. Carefully lift up the motherboard on one side. The processor (CPU) is located under the heat sink. Thanks! Helped me to replace the fan. Thanks , It helped opening my laptop to reset the cmos battery , the problem that I still have is that my usb ports gives power but it won`t pick up any usb devices. Can anybody help! THIS IS REALLY GOOD GUIDE. IM UPGRADING MY OLD PRESARIO WITH NEW DDR, CPU FAN, WIRELESS N, AND NEW HARD DRIVE. THIS GUIDE COVERED EVERYTHING. I WILL USE IT ONE MORE TIME TO UPGRADE THE SCREEN TO THE HI-RES LCD FROM THE NORMAL 1048×768 IT COMES WITH. REALLY GREAT TO FIND SOMETHING LIKE THIS FOR AN OLDER MODEL LAPTOP. Thanks it is really help me to replace the mother board , apprecaited for the detail guide. Some info works for V2000! I used your instructions for replacing the LCD inverter by removing the keyboard bezel to remove the front screen bezel on a V2000 (not M2000). 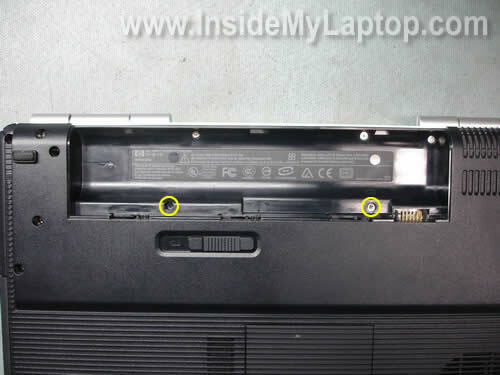 The two screws to be removed that hold the key bezel in the battery compartment are in a similar arrangement on a V2000 as the M2000 but closer to the rear of the laptop, about in the middle of the battery compartment. This made is much easier to remove the front screen bezel (without removing the whole screen unit from the laptop), which I was afraid of breaking at the hinges. ….was just about to order a repair disc from U.K. I followed the directions to take off the bottom cover, but part of it is stuck. A small area near the battery will not release. My goal is to take off the bottom and locate the motherboard. Not sure what I am doing, so I wanted to check before I break the bottom plate getting it off. Any help would be greatly appreciated!! The usb ports (all) on the M2000 have stopped working. Techs think it is a motherboard problem. If I try to replace it myself, do I need to remove everything listed before removing the motherboard? Could their be something else wrong to prevent the usb ports from working. sometimes they do and then they die. The usb ports (all) on the M2000 have stopped working. Techs think it is a motherboard problem. If I try to replace it myself, do I need to remove everything listed before removing the motherboard? Yes. Just follow the guide until the old motherboard is removed. Replace it with a new one and assemble the laptop. Could their be something else wrong to prevent the usb ports from working. sometimes they do and then they die. Could be software related problem. Before replacing the motherboard, I would try reinstalling Windows from scratch. If no help, you’ll have to replace the motherboard. 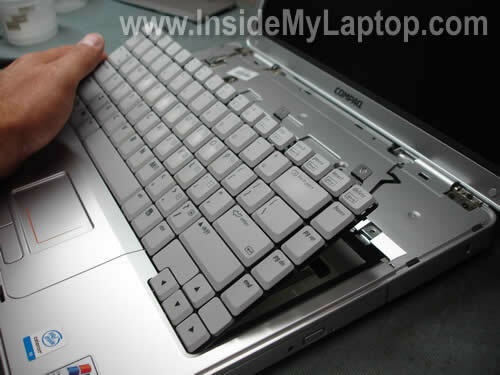 Firstly Thanks for publishing excellent pictures of how to dismantle a Laptop. 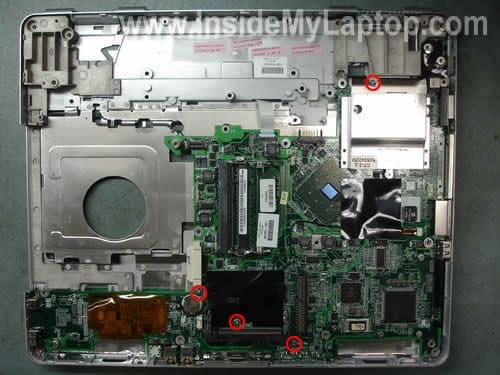 I used ur pictures for repairing a cpu overheating problem of my compaq M 2010US model. The blockage of cpu heatsink fins was compelling the Laptop to shutdown after 15 mts or so. 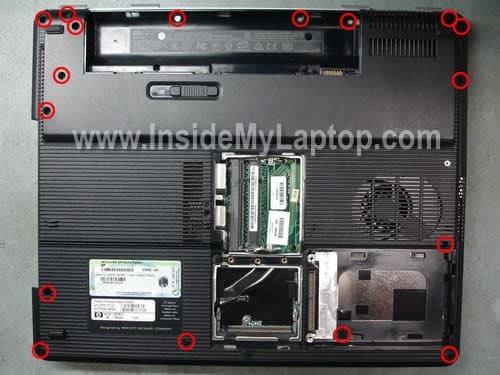 After clearing it my Laptop is working OK.
Looks excellent tutorial .i will use this tutorial to open my presario m2000 laptop which is suffering from heat issue and stops suddenly while working. 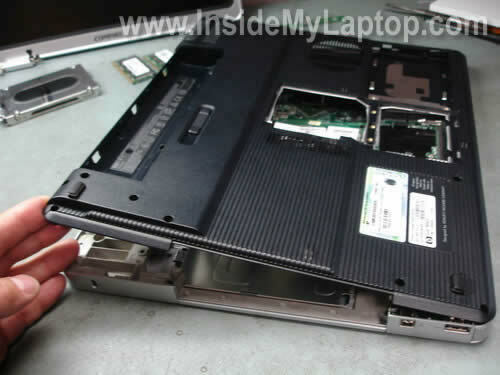 Before you disassemble the laptop, try cleaning the cooling module with compressed air. Find an air compressor (you can use canned air too) and spray air inside the intake on the bottom until all dust is gone. It might help. firstly i push power button but computer didnt open.. no signal no lights..
then i disassemle rtc baterry and assemble it again..
after that computer open , lights on; but just a black screen on monitor..i couldnt hear reading sound from harddrive.. it is working but wasnt read form computer..
i dont know what is the problem.. i want to fix it myself because in my living place i cant find any computer experts or hp services..
i didnt wear any anti-static things… i dont now if it is the problem..
ok , i fix my problem.. thanks for useful guide..
Is there a shortcut to changing the cmos batt on my presario 2100? Not sure if Presario 2100 is any different from Presario M2000, but in the last one there is no shortcut. You have to remove the motherboard first. This tutorial was great. It was the first time that I opened a computer, and it was awesome. So I had a bad power connector board that I replaced, and now the computer is back to working just fine…except that the battery won’t charge. The cord, power connector, and battery are all new. Is the battery board possibly my problem? I feel like I’m so close to having my laptop back. It sat, not working for so long. Now I just want to have the freedom to unplug it from the wall. Thanks for the help in advance. So I had a bad power connector board that I replaced, and now the computer is back to working just fine…except that the battery won’t charge. The cord, power connector, and battery are all new. Is the battery board possibly my problem? Did it charge the battery before? The battery plugs directly into the motherboard. 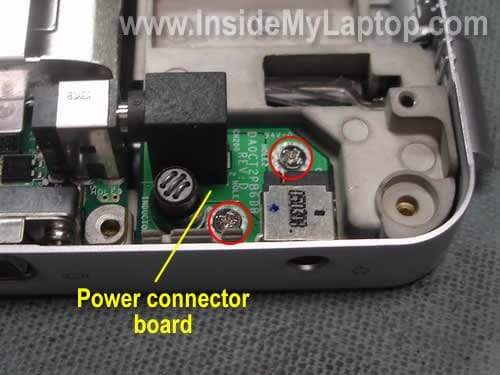 If the battery will not charge, there could be a problem with the motherboard, not the power connector board. I believe the power connector board simply supplies power to the motherboard, but the battery charging circuit is located on the motherboard. No, the power connector board is fine. I bought a new one and now the computer works. I was asking about the battery board (Step 24.) I didn’t know if that connection to the motherboard might be too weak to power the battery. The battery status would say charging on the screen but it would not actually charge it. Also, if the battery charging circuit is the problem, is that something I could have a crack at or would that be too challenging? I don’t have a background in fixing a computer’s internals but think it could be fun. Thanks again. You’re awesome. I was asking about the battery board (Step 24.) I didn’t know if that connection to the motherboard might be too weak to power the battery. It’s possible but unfortunately I cannot tell if this is the problem. You can try cleaning contacts on the battery board and try reconnecting it. Also, if the battery charging circuit is the problem, is that something I could have a crack at or would that be too challenging? It will be too challenging unless you have some experience fixing motherboards on the component level. Awesome walk through, although there was a couple extra screws I had to take off, that wasn’t pictured. I have a Compaq Presario M2000. Great help. Thank you. My M2000 one day just doesn`t start, what could be ? How can i test ? I was almost giving up my Presario M2000 after several occasions I tried to open it up to clean the Fan and heat sink from dust. I thought it was all over when I couldn’t do anything to put it apart. I am really thankful to the good people who always share their know how (Do it yourself) technique. Otherwise I had to spend $120 to take it for service. Please keep it up with good ideas and help. i think it is a very usefull for compaq laptop holders . 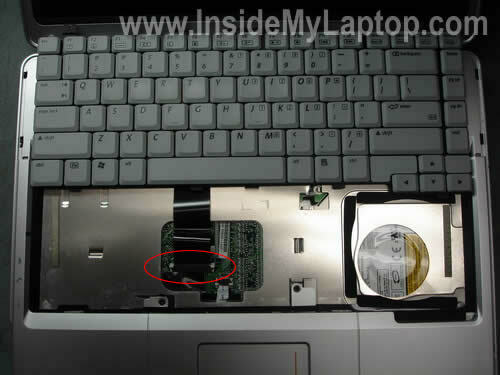 In my laptop as i turn it on every thing works execpt their is no light on display , sometimes it comes at laptop work properly , but now only their is no light in display so please suggest which part i should replace to repair my laptop. 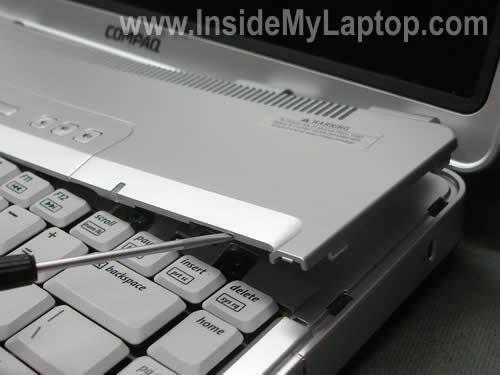 The above how-to also works for a Compaq Presario M2370EA. This model does have the wireless card onboard (and bluetooth). I have an Compaq M2000 that the display has gone very dim, still an image there. Where is the inverter board? 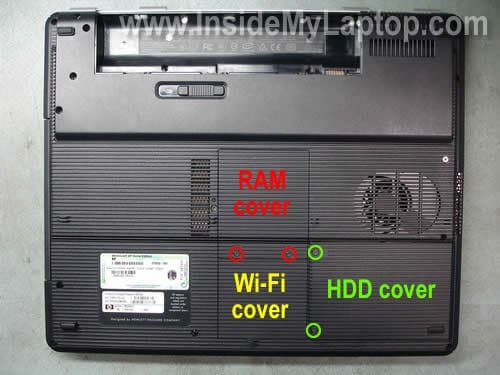 Is it under the keyboard or under the display in the top of the laptop? Sorry about my previous post, I found the tutorial on removing the display and the inverter. There is no mention of a specific part number for the inverter board is this a universal part for Compaq or should I remove the old one first to check for a part number? 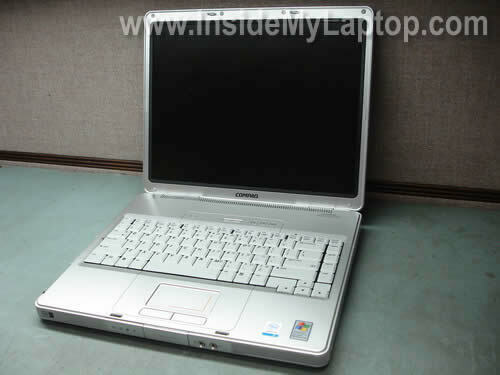 I have another guide for Compaq Presario M2000. This guide explains how to take apart the display panel. The inverter board mounted inside the display panel, below the LCD screen. Take a look at the guide and you’ll see it. There is no mention of a specific part number for the inverter board is this a universal part for Compaq or should I remove the old one first to check for a part number? 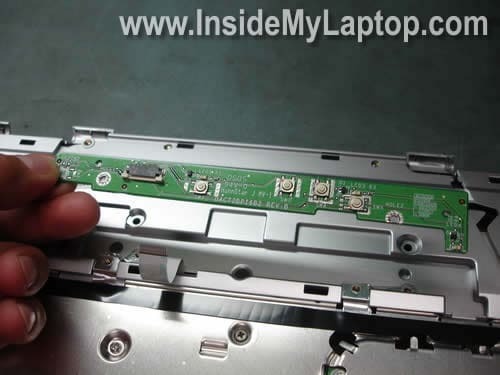 Probably you can find HP part number for the inverter board in the service manual. You can download manual from HP website. 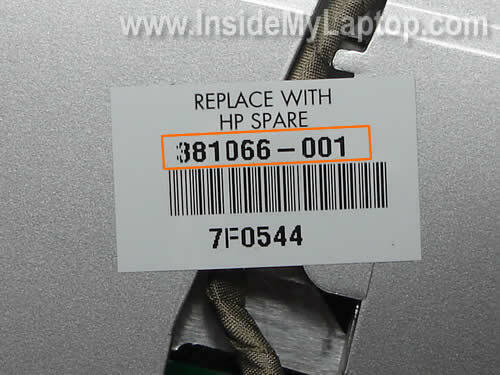 What is your exact part number, not just Compaq m2000 but something like Compaq m2010us? Awesome guide, thanks for putting it up. Thank you so much for posting these instructions! I found them to be very useful. My compaq presario m2000 doesnot boot nor it shows bios setup. please help. Many thanks for the guide, excellent, very, very helpful. Do I have to remove the keyboard and screen to take the bottom off? I just need to replace the fan. Thanks very much for posting these instructions! It helped us pull the laptop apart in order to clean the fan area which was clogged up and caused the device to overheat and shut down. Once again thank you for an excellent web page. About 6 months ago I disassembled my Compaq Pressario M2000 to fit new speakers. It worked but kept on overheating. So I have just disassembled it again and found that I had not screwed the heatsink to the cpu. So I replaced the screws and the heatsink compound and now seems ok. There are so many screws and so many of them are seized and so break when undone. So now I have rather less screws then ever before. I wish that they would make a laptop with a strong aluminum case and a standard size and shape like a PC. THank you so much!!!!!!!!!!!!!!!!!!!!!!!!!!!!!!!!!!!!!!!!!!!!!!!!!!!!!!!!!!!!!!!!!!!!!!!!!!!!!!!!!!!!!!!!! this helped me. Thank you for your time to do this video! It allowed me to repair myDC power port. my laptop works without those two ram modules. How????? Cannot be. 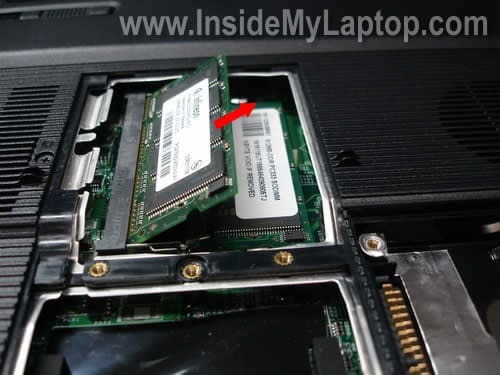 If the laptop has only two memory slots and you removed both memory modules it will not work. I would like to replace the bios battery before it goes bad or leaks. I wouldn’t touch it if the battery still works. I believe it’s a regular CR2032 battery. The battery is smaller than normal. not a 2032. number is ML1220 3 volt + on top. maxell Rechargeable.. Ton of screws to get to it. Hp has some good guides. Thank you so much for this guide, you helped me a lot. ive stripped and replaced 2 usb, on re assembly, had a drive lock problem, so got a new HD… now it is booting up to a multimedia cable fail error message, not finding the HD,……. which is the multimedia cable? is it the white ribbon one from the button board? everything seems to be connected ok.
Windows will start to install, but shows no partitioned drive…. so its not finding the HD. now it is booting up to a multimedia cable fail error message, not finding the HD,……. which is the multimedia cable? Hard drive in this laptop doesn’t have a cable. It’s connected to the motherboard via an adapter (attached to the hard drive). 1. Bad connection between the drive and motherboard. Try reconnecting the drive. 2. Bad hard drive adapter. Try replacing the adapter. 3. Bad nard drive. Try connecting the hard drive to another computer and see if it’s recognized. 4. Motherboard failure. In this case laptop not worth fixing. Thank you very much, couldn’t have accessed power connector board without these detailed and excellent instructions. 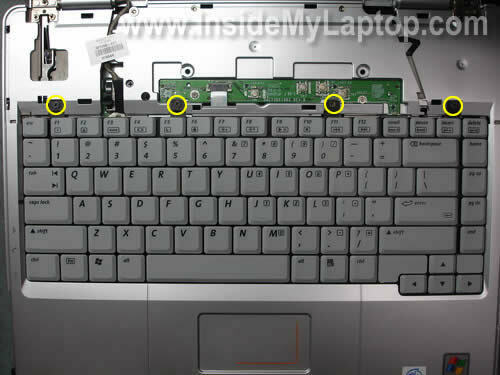 One note, my Presario M2000 has one more screw than illustrated (Step 18). Great job!